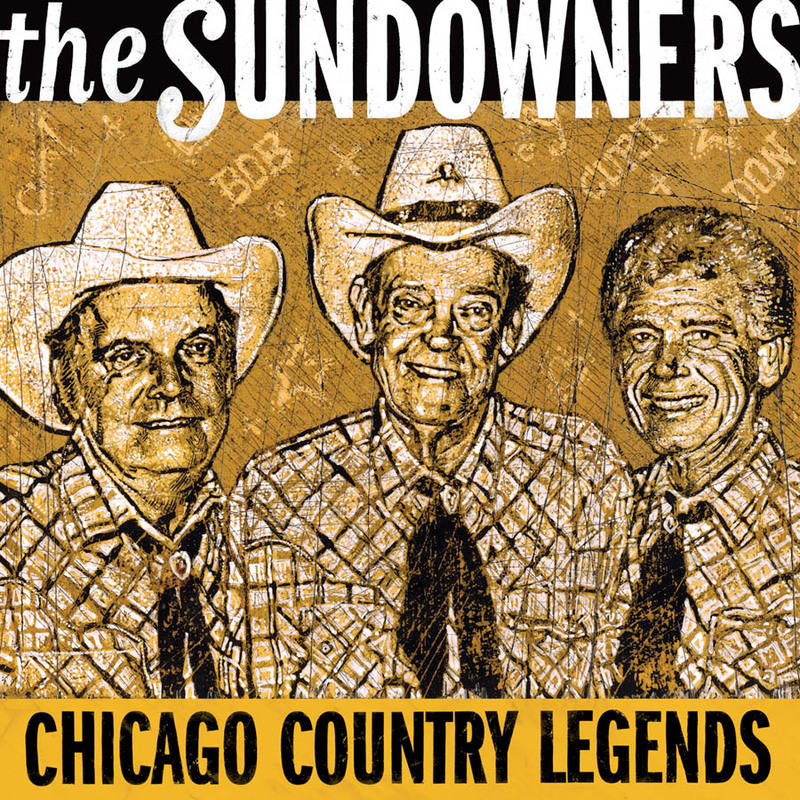 To simply call The Sundowners a country-western trio is to diminish their free-swinging landscape of long-neck bottles, neon lights and bright ideas. They held court in several downtown Chicago honky tonks from 1959 to 1989 and provide a direct, important historical road map of Country’s Northward wanderings--away from the mountains and plains and hollers and towards the factories and jobs. They took their name from a 1960 Robert Mitchum film and learned more than 15,000 songs, playing about 7,000 songs annually. Influenced by groups like the Sons of the Pioneers, the Sundowners sang harmony as if they were family. But they often updated traditional cowboy harmonies by reworking Appalachian, Tin Pan Alley and traditional western melodies for an urban audience. The result was a legion of fans that stretched over the decades and over all musical tastes, and included hundreds of musicians and celebrities stopping by their Bar RR whenever they were in town--folks like Fats Domino, Sting, John Entwistle, the Mekons, Mickey Mantle, Robert Duvall, Don Gibson and so many others. The tracks on this collection were recorded between 1960 and 1971. Country and Western standards rub shoulders with The Sundowners’ takes on Beatles ("Something") and Bobby Darin tunes. The sounds of glasses breaking and waitresses yelling make the occasional appearance, and west coast guitarist Johnny Davis sits in for a few. The Sundowners’ music and love of life struck a chord with generations of music fans; fans who liked all kinds of music. They are true legends in Chicago and an important part of the city’s ongoing connection with country music. Cover art by Jon Langford. On this collection, the Sundowners never sound tired... [they are] a polished, casually virtuosic group at ease with one another. But their tradition-bending repertoire is what sets them apart. Able to tackle suicide (‘Last Letter’), poverty (‘Streets Of Chicago’) and death (‘Miller’s Cave’) with the same aplomb and verve with which they tackled quasi-novelties like ‘Little Green Valley’ and ‘Little Pedro’—The Sundowners attained a legacy which has outlasted them. Their triple-barreled hillbilly harmony rings true [and] The Beatles' ''Something'' gets recast here as a country shuffle, with bright guitar picking that would make late songwriter George Harrison smile in heaven. The fun-loving trio was known for gentle harmonies, flashy Western stage wear and an affinity for working-class country music. A treasure of RARE material by Jimmie Davis--a genuine C&W pioneer. Fast-paced instrumental breakdowns, crooning, velvety ballads, smooth trio harmonies, and story songs.